After State Capture, Is It Decline or Growth for South Africa? After State Capture - Populism, Corruption & Decline or Growth, Jobs & Prosperity? 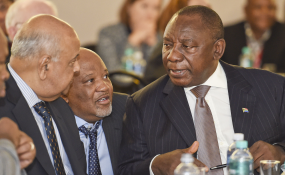 Mcebisi Jonas, centre, seen consulting with President Cyril Ramaphosa, right, and former finance minister Pravin Gordhan in 2016, says South Africa can again prove to the world its resilience and resolve. Former deputy finance minister Mcebisi Jonas has made startling revelations at the judicial commission of inquiry into state capture, saying one of the Guptas threatened to kill him. "At the end of the meeting, Mr Gupta repeated that they had information on me, and if I suggested that the meeting had occurred, they would kill me," Jonas testified on Friday. He did not specify to which Gupta brother he was referring. He also told the commission that the Hawks wanted to "kill" the corruption case the Democratic Alliance and Congress of the People (COPE) had opened, and that then finance minister Nhlanhla Nene was fired in 2015 because he was blocking the nuclear deal. Jonas is the second witness at the judicial commission of inquiry. He detailed his apparent meeting with one of the Gupta brothers at the family mansion in Saxonwold in October 2015 and events that followed the meeting. According to him - the man he believed to be Ajay Gupta - offered him Nene's job if he agreed to help the family increase their earnings from the fiscus through various entities, including Eskom, Transnet and government departments, from R6bn to R8bn. "Mr Gupta said they had determined that the National Treasury was the stumbling block for their growth and that they wanted to clean up Treasury," Jonas said. The meeting was held weeks before Nene was fired in December 2015. Former president Jacob Zuma fired Nene on December 9 and replaced him with Des van Rooyen, who only lasted the weekend as Zuma was forced to replace him with Pravin Gordhan, who returned for his second stint as minister. Nene's firing sent the economy spiralling and caused widespread outrage from the ANC, business, civil society and ordinary South Africans. Jonas again repeated the claim that controversial businessperson Fana Hlongwane and Zuma's son, Duduzane, organised the meeting and were present when the death threat was made. However, he said, both remained silent as the Gupta brother "spoke like the radio". He testified that when he turned down the offer, the Gupta brother was emotional, agitated and "was on the verge of punching me". Jonas said the Gupta brother told him that they were in charge of Zuma and key state institutions and that they had the power to kill his political career. "You must understand, we are in control of everything, the National Prosecutions Authority, Hawks, intelligence services, and the old man [Zuma] will do anything they want him to do," Jonas claimed the brother told him. "Mr Gupta said I would have to work with them, and if I worked with them I would become rich and he could offer me R600m and pointed at Duduzane Zuma and said they had made him a millionaire and he has bought a house in Dubai." He said the Gupta brother also said the family was working with former public enterprises minister Lynne Brown and former Eskom boss Brian Molefe, who were "very protected". Jonas testified that he did not report the matter to security agencies because of the threat and he believed the Hawks and police were "compromised". "I anticipated reporting the matter will result in reprisals," he said. However, he gave details of the meeting to Gordhan and Nene. Jonas also revealed that the Hawks tried to kill the case, by preparing a statement on his behalf. He said he was contacted by then Hawks head Berning Ntlemeza, who said he assigned head of serious corruption investigation Major General Zinhle Mnonopi to the case the DA and COPE had opened. Jonas said Mnonopi wanted him to sign a prepared false draft statement to say that he was not a witness to corruption but he was not willing to do so. "Mnonopi said this was a DA matter and that I did not want to help the DA and they want to kill the matter," he said. Jonas also confirmed that Nene was fired because he was blocking the multi-billion rand proposed nuclear deal. He said at the time, they worked under "difficult conditions" with no support from Zuma and the Cabinet. "There was pressure on us to approve the nuclear deal... the pressure was immense and was the trigger of Nene's dismissal after he refused to back the deal in a Cabinet meeting," he testified.